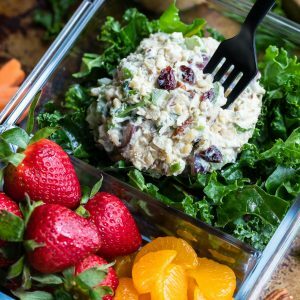 Jazz up your make-ahead on-the-go lunch game with this Cranberry Pecan Chickpea Salad Sandwich with Healthy Kale Salad: 2 ways! OR SERVE IT ON A SALAD! Grab a few handfuls of Nature's Greens® Kale Greens and let's get our salad on! Add the kale to a large bowl and drizzle kale with a tsp or two of your favorite healthy oil and a pinch of salt. You can also add a squeeze of lemon juice if you'd like! Massage the kalewith your fingers until kale darkens in color and takes on a velvety texture. This little rub-down turns the curly kale leaves into a tender and silky salad green! Serve a jumbo scoop of cranberry pecan chickpea salad on top and drizzle with balsamic dressing before diving in! Drain and rinse your chickpeas and add them to a large bowl. Mash with a potato masher until texture appears flaked, almost like tuna salad. I use both a potato masher and follow up with a fork to make sure every chickpea is deliciously smashed. You could also use a food processor and skip the arm workout entirely - it's crazy easy! If you decide to toast your pecans (SWOON!) here's how to do it: Preheat oven to 350°F. Lightly spritz a baking sheet with cooking spray. Add pecans in a single layer and toast until they're aromatic, approx. 4-5 minutes. Chop your green onion, celery, grapes, and pecans. Fold in sunflower seeds (as much or as little as you'd like) and adjust any ingredients to taste. Pile high on fluffy bread with kale, red onion, and sandwich spread of your choice, or serve a scoop or two atop a bed of tasty massaged kale with a side of balsamic dressing. You can even add a drizzle of balsamic glaze on top - it's AMAZING! See post below for bonus kale salad recipes and two tasty homemade salad dressings to serve with them!